Don’t you just hate it when a longtime favorite and much loved wardrobe staple of yours gives up its ghost? Yeah, always a bummer! My decade and a half staple – a bohemian-style, maxi length, lightweight denim skirt – ripped apart from too much love. Well, for someone who sews all chances of having a replacement is not entirely lost. It took me two years to find the right pattern and fabric to finally have a lovely replacement that I love almost just as much as my original – this is saying a lot! Sure, I had plans to make a pattern from my old favorite but I realized it might not be a bad thing to move on with my style and try something similar yet different at the same time. Also, because one basic staple deserves another, I have my new denim skirt paired with a slightly seductive, vintage, knit white tee for another wardrobe filler. I’m hoping my set has a slight nod to the 1970s era yet still stays modern. 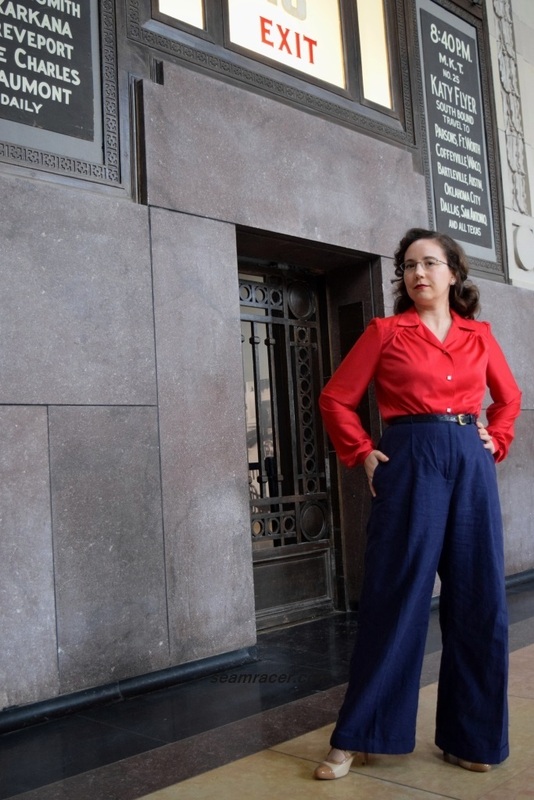 To have a garment be an indispensable staple piece, yet also vintage and modern, is the best combo ever for those days when I want to blend in yet still wear styles which pay tribute to the past. Every time I make something really needed and purposeful (not just what tickles my fancy), I realize how beautiful sewing the basics can be. This is why my outfit (specifically my skirt) is part of the Petite Passions’ Wardrobe Builder Project for the month of May. As you can see, it is helping me get the motivation to build on my everyday casual wardrobe! NOTIONS: Besides the invisible zipper, which I bought because I don’t necessarily keep ‘specialty’ zips on hand, everything else needed was basic (thread, interfacing, bias tape) and came from on hand. TIME TO COMPLETE: The top was sewn a while back now, finished on August 24, 2015 after only 3 hours’ time. The skirt took me about 5 hours to make and was finished on May 16, 2017. THE INSIDES: My skirt is all clean inside with both French seams and bias tape while my knit top is raw edged inside (as it doesn’t fray). 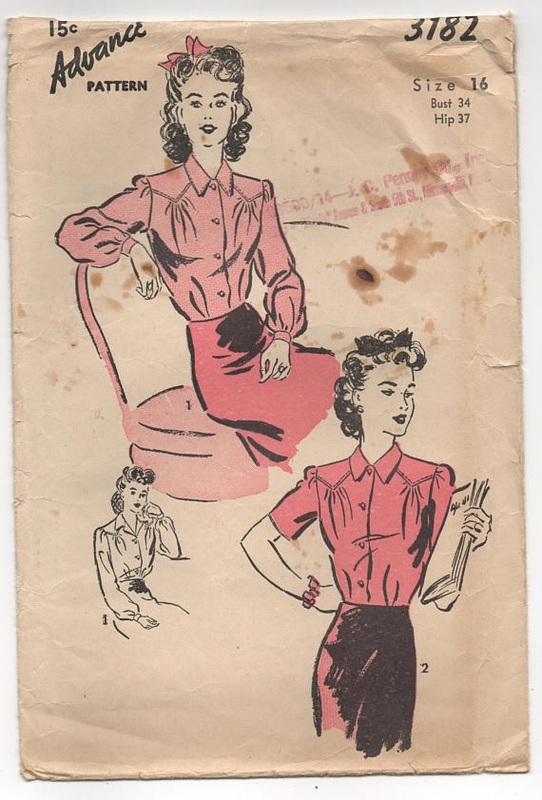 TOTAL COST: The top’s ribbed fabric was a miserable little scrap remnant – technically it was about one yard but was badly hacked into with all the corners squarely cut off. 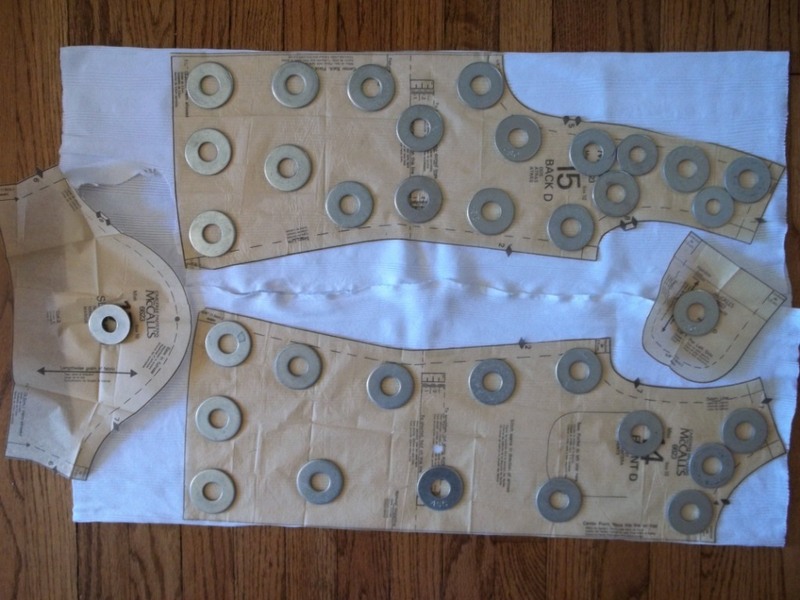 See below the “tight squeeze” to fit the pattern pieces on it. The knit was bought for about $2 when Hancock Fabrics was closing. The denim was bought the year before from Jo Ann’s Fabric store for about $9 (more or less I don’t remember). I suppose my outfit is about $12 but priceless in utility to me! There were only subtle changes that I made to the skirt for my version. The main change, to lessen the gathers of the lower panel, was part taste. I planned on doing that anyway, but the amount of the gathers was dictated by the fact I was working with only 2 yards of material while using a pattern calling for at least 3 yards. 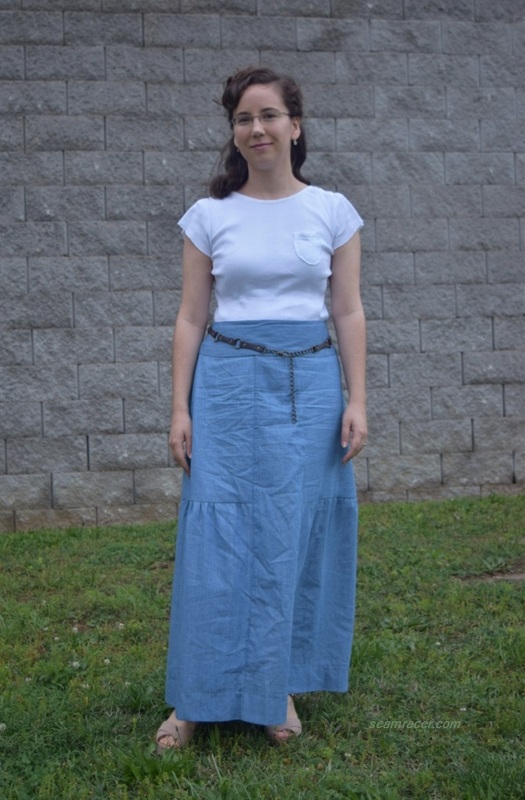 I am a smaller woman, and on the edge of being petite height, so I figured such a full maxi skirt as the original design might be a bad idea. I really do like the skirt fullness as it is now even if I did not get to choose exactly how I wanted it. Sometimes “making do” works better than trying to start from scratch to be ‘perfect’. 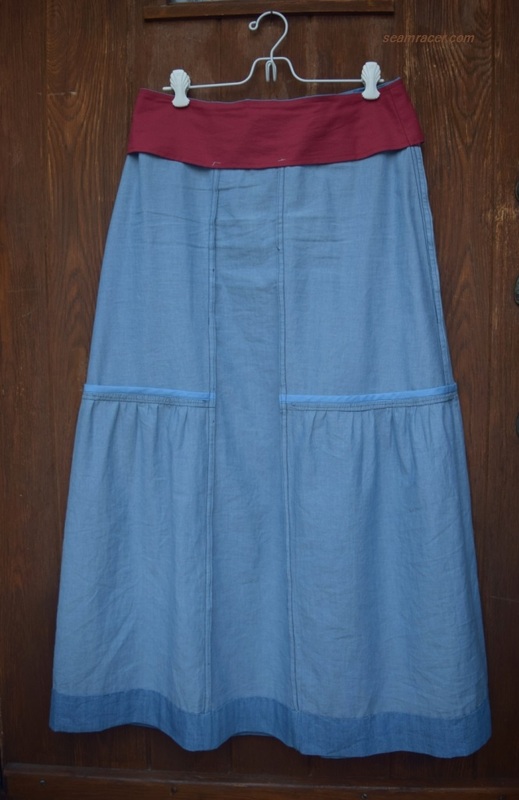 Other than changing the amount of gathers, I sewed the gathers onto the upper skirt piece like a normal seam rather than top-stitching on like the pattern called for. This top-stitched panel would’ve created a frilly ruffle where the two panels came together. 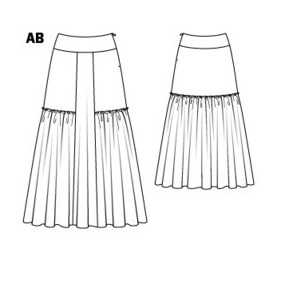 I was decreasing the gathers for a slimmer skirt and a frill through the middle of a half-gathered panel would have messed with the silhouette. This regular seaming also saved me the trouble of finishing the one edge of the gathered panel so I could equalize my time spent to invisibly hand-stitch down the hem. 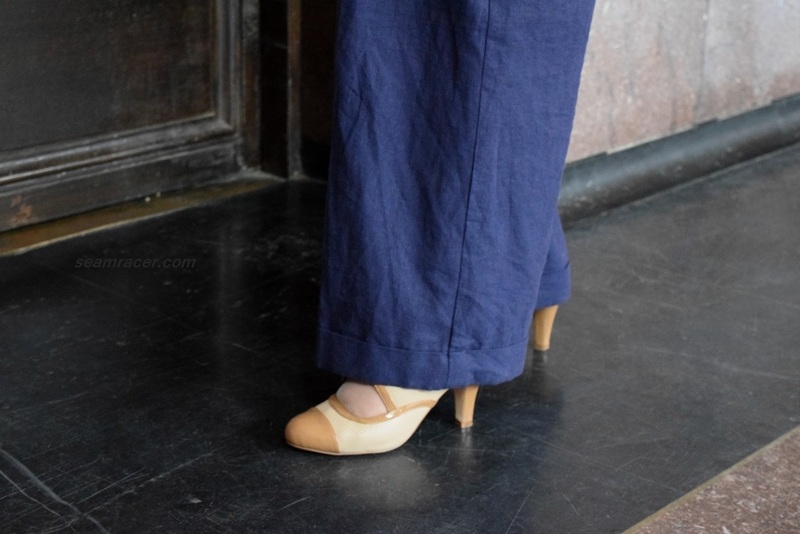 I already took out 3 inches from the overall length but my hem even still became a wide 3 ½ inches. This baby runs very long as if it is a “Tall” sized pattern. It does sit on the hips, with the top of the skirt riding just below my true waist. 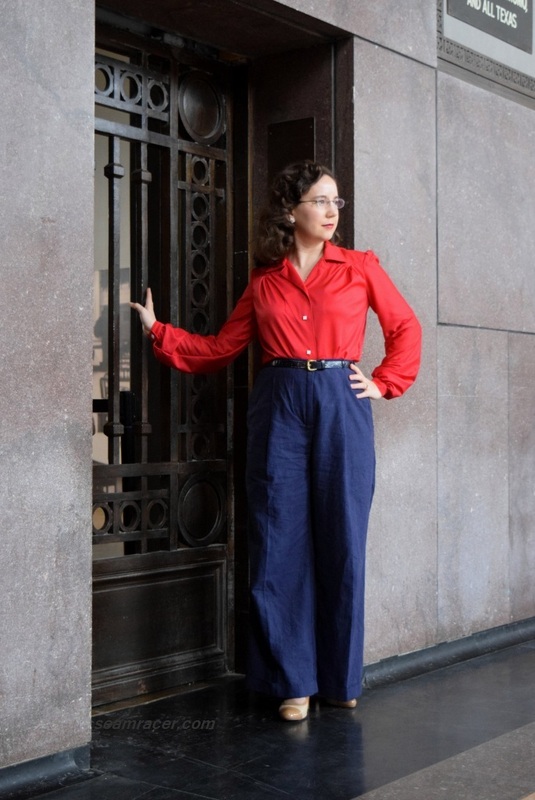 As one who wears a lot of vintage, which almost always has a high-to–true waist, I still like this feature which is more modern, it’s just a change for me (not a bad thing, as I said above). 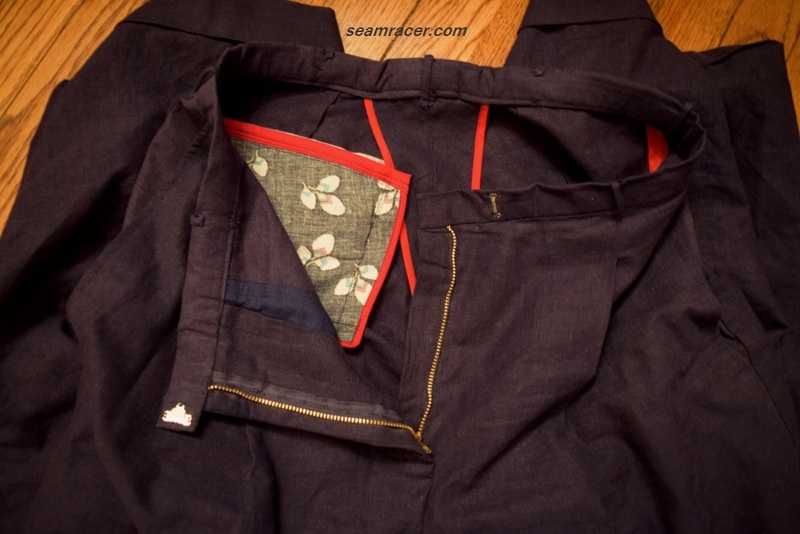 As I went through the extra effort to make no stitching visible, under stitching the facing at the waist and having a hand-done hem, I figured an invisible zipper here was the only way to go. After having my last invisible zipper failing on me and trapping me in my dress back in 2012 (post on that here), I have taken a long hiatus from this specific notion but coming back to it has been a refreshing and rewarding success. 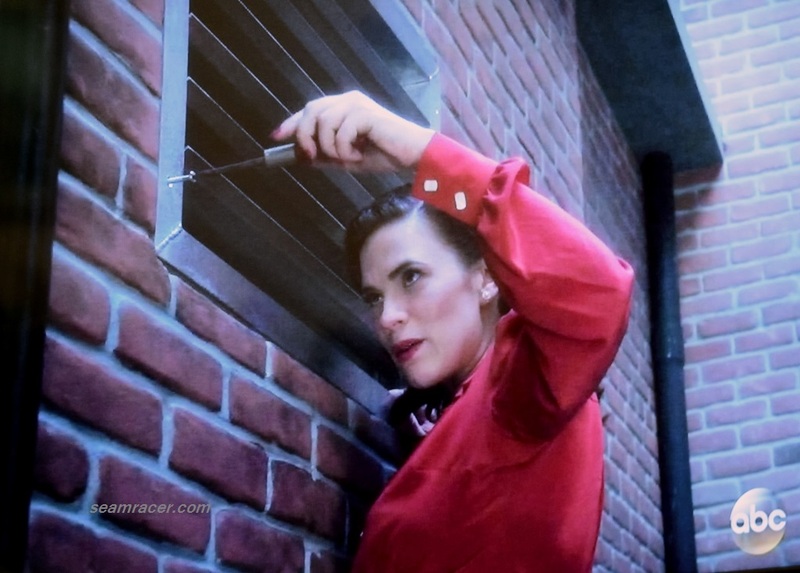 I love how you don’t see anything but the zipper pull…but, yes, I realize that’s why they are called invisible! 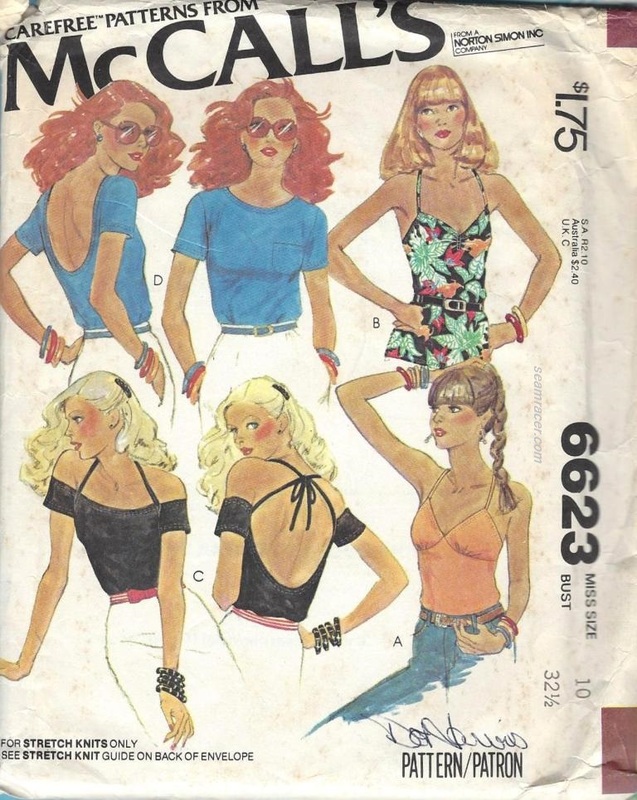 My top is the third time I have used McCall’s #6623 pattern – this is unprecedented for me! 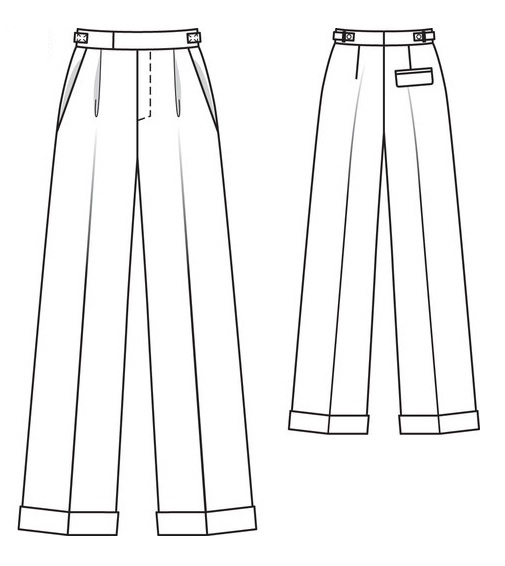 (Here are my first and my second versions of this pattern.) I still yet want to have the gumption to make and wear that strappy cold-shoulder version. The tank is so lovely and basic I need to make a few of those in some basic colors. For some reason I really love this one pattern, and it loves me by the way it fits me so darn well. I find this pattern interestingly unique, not just from the fact that each view top has its own pieces (none shared), but because of the small “From a Norton Simon Inc. Company” logo next to the McCall’s logo. This pattern’s year, 1969, was a decade after Norton Simon himself retired from active involvement in his business. What’s up with that?! Not too many people know that Norton Simon, the smart art collector and businessman behind Max Factor cosmetics, Avis Car Rental, and Canada Dry Corporation (to name a few), also controlled the McCall Corporation and all its publishing (magazines and such) between 1959 and 1969. How I have not heard of this man, who seemed to have an influence in so much of the companies and products that are a part of our modern lives, before recently? He was on the cover page of TIME magazine on June 4, 1965, in People magazine (1976), and even ran for the United States Senate (in 1970). His conglomerate is now ranked 112th on FORTUNE’S list of the 500 largest American corporations I wonder why this is the only McCall pattern I have seen with his naming rights on it. See – patterns are so interesting in so many ways! 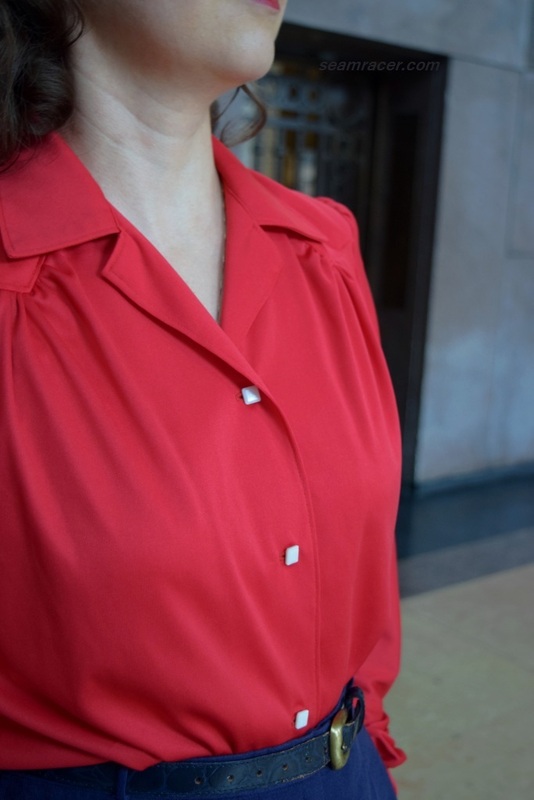 Sewing this top was super simple and easy. This is the first time I have used this pattern un-altered. I did have to add in snap on lingerie straps made from ribbon to anchor the shoulder to my underwear. Otherwise the shoulders on this open-back hottie piece slide a bit all over the place. 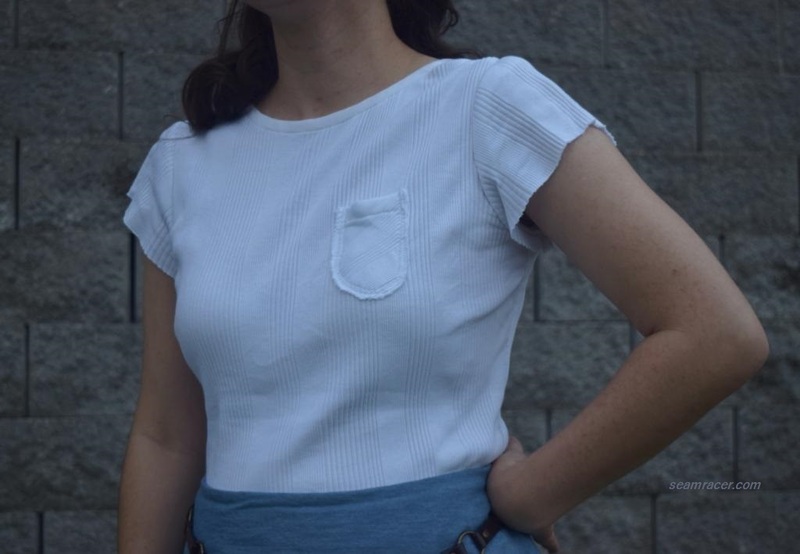 Basic bias tape adds a bit of soft shaping and contrast finishing for the neck edges, and a little left chest pockets adds some small utilitarian interest. 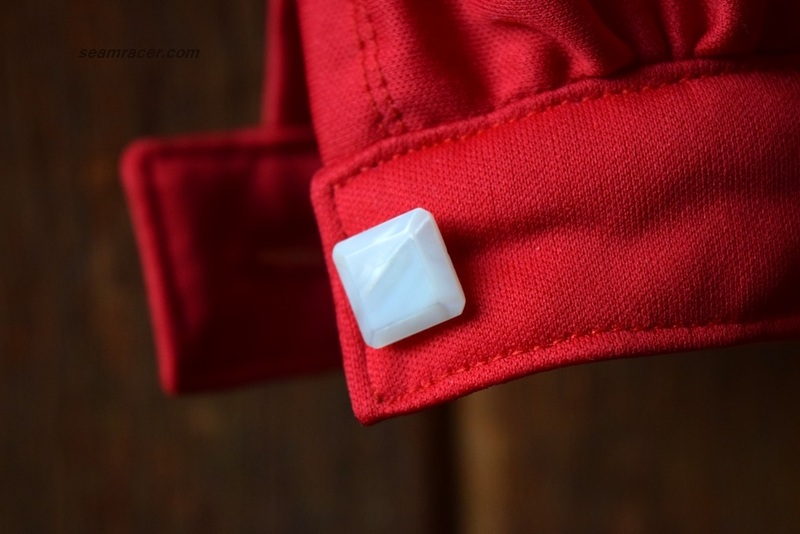 My biggest setback was working with the rib knit – a very first for me to work with. I thought I had this pattern understood but not this time. I had to sew the side seams several inches smaller than normal to accommodate the give of the ribbing. It acts like a slinky toy! It was a tough call to figure out the sweet spot between too loose of a fit and too snug. I didn’t want the rib knit to lose its design when fitting over me yet I wanted it to be body complimentary without being a second skin. After several stitchings, un-pickings, and re-stitching spells I like the balance I found. This top does look so hilariously small on the hangar – the ribbing springs back so it seems like something for a 10 year old girl. It also is best dried flat after washing. The weirdness of the rib knit also meant all my hems are unfinished – not by choice but at least I think the raw edges look good on this occasion. This quirky material has a definite personality! Working with it was a definite learning curve. Between all the challenging and involved projects that I want to make (from my too numerous ideas), sewing basic necessities always is a pain to get around to. 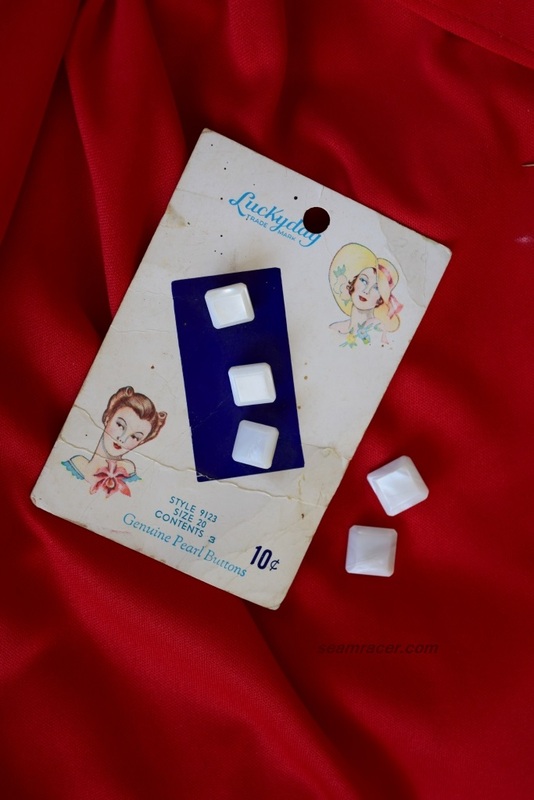 Who completely wants to sew something merely because you need it, when nowadays ‘stuff’ is so easy and available to buy? And yet, such sewing also always ends up so satisfying for me and it always amazes me. The staple clothing necessities that you reach for everyday can be an uncommon source of creative pride and possess better individual style if you don’t exclude them from receiving the personal touch of hand sewing. I’m practicing what I preach lately by giving away a good amount of the ready-to-wear that I do not like or use so that my ‘me-makes’ and my vintage pieces can take over my wardrobe. Do you make your tees, and jeans, and anything else basic? If yes, do you like them better than the ready-to-wear option? 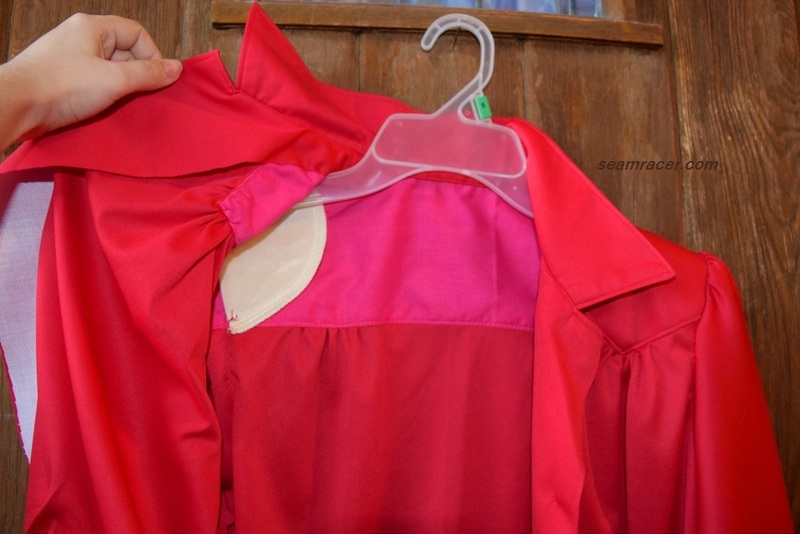 Have you ever worked on sewing up a replacement for an old favorite garment? Is sewing what you need something that you have a love or a hate attitude towards? Maybe, like me, you feel a bit of both? What is your experience (if you have one) with rib knits? 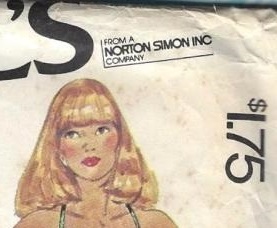 One last query – has anyone else seen a McCall’s pattern with a “Norton Simon” logo? If you have any feedback for these questions, please do share – I like to ‘hear’ what you have to say! As always, thanks for reading.